[PRESS RELEASE] LOVELAND, Colo. – June 13, 2016 – Loveland has launched a craft beer brand and free beer passport program, creating an all-encompassing craft brewery experience that highlights the best Loveland has to offer. The new brand and tagline, “Love. Beer. Culture.” highlight themes amongst the city’s tourism assets. 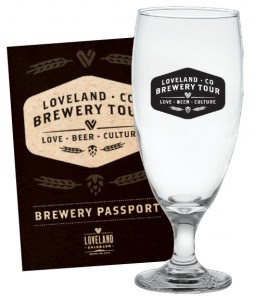 As one of Colorado’s only free beer passport programs, Loveland’s passport provides deals to most of Loveland’s breweries, as well as the opportunity for participants to take home a commemorative Loveland-branded glass or T-shirt. Participants must be 21-years-of-age or older to complete the passport. Safety is our highest priority. Please drink responsibly. ​ ​For more information and to plan your Loveland craft beer tour, visit the new website LoveBeerCulture.com. Fermentedly Challenged's comments: This deal has no expiration date so you can take your time getting your passport stamps filled in. As new breweries open in Loveland a new passport will be updated. It is possible to complete one passport and get another passport and start again if you wish to earn both the t-shirt and the glass. This article was posted on FermentedlyChallenged.com - a Colorado beer blog. Don't miss another article. Subscribe to Fermentedly Challenged by RSS today.